The Arch Dalrymple III Department of History at the University of Mississippi offers programs of graduate study leading to the masters and doctoral degrees. The core of the program is, of course, the faculty, who offer a wide variety of graduate courses in United States and European history, with additional courses available in Latin American, African, Asian, and Middle Eastern history. The department includes faculty members from all over the United States and from Europe, and their interests span the full chronological sweep of American and European history, as well as much of the histories of Latin America, Africa, Asia, and the Middle East. 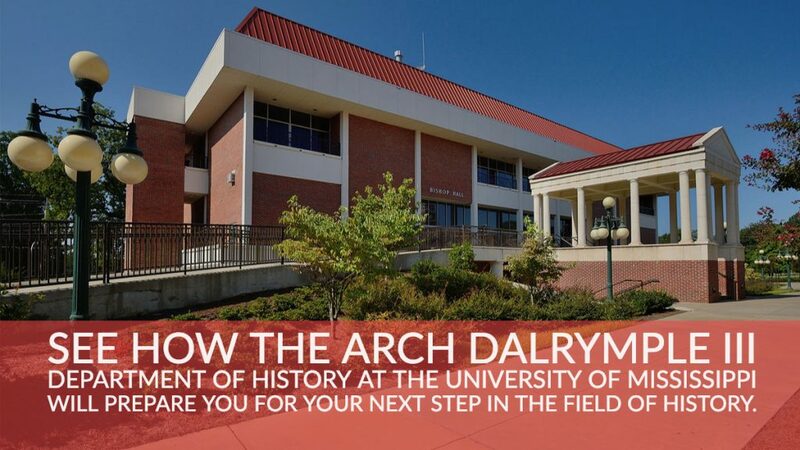 The Arch Dalrymple III Department of History maintains close relationships with several interdisciplinary programs at the University, including the African-American Studies Program, the Center for the Study of Southern Culture, the Croft Institute for International Studies and the Sarah Isom Center for Women and Gender Studies. It also engages in many activities to enhance its regular research and teaching programs and to enrich the intellectual lives of its students and faculty. Each year the Department co-sponsors the Porter L. Fortune Jr. History Symposium. Held every fall since 1975, this three-day conference brings well-known scholars to campus to discuss their research and interpretations on various issues, often relating to southern history. Recent symposium topics have included Gender and the Southern Body Politic, the Civil Rights Movement, Religion in Southern History, and Britain and the South. Within the University, the Arch Dalrymple III Department of History also has close ties with the John Davis Williams Library, which contains more than 1.7 million volumes and another 300,000 eBooks. Of particular importance to history graduate students are the Mississippi Collection of books and manuscripts pertaining to the state, the Blues Archive, and the depository of federal government documents. In its masters and doctoral programs, the department emphasizes both rigor and flexibility in designing a course of study to fit the individual interests of each graduate student. The Graduate Advisory Committee administers the program. Each graduate student designs a program of study in consultation with the Graduate Program Coordinator and other faculty members of the department. Approximately sixty students from a wide variety of backgrounds are currently pursuing graduate degrees in the department. To gain admission to the graduate program, an applicant should have at least a B average as an undergraduate, should have majored in history (or have taken a significant number of history courses), and should have achieved an acceptable score on the Graduate Record Exam. All M.A. students must take the following courses: Historical Methods and Philosophy of History (HST 550), as well as the one-hour Professionalization and Colloquium I (HST 601) in their first semester in the program; a 700-level research seminar (encouraged in their second semester); three 500-level historiography courses (a maximum of two can be within a single field). Students specializing in fields without historiography courses may substitute two courses in one of these areas in partial fulfillment of the three required historiography courses. Moreover, an M.A. student may, with prior approval from the Graduate Advisor, take for credit a limited number of graduate-level courses in other departments. Students pursuing the Master of Arts must choose between two different programs of study. The thesis option requires 24 hours of courses and at least 6 hours of thesis credit. The student will write the thesis under the direction of a faculty adviser and evaluated by a committee consisting of the adviser and two other faculty members. The student will identify a committee by the beginning of the third semester in the program. The student will present a thesis prospectus by the end of the third semester in the program for approval by the committee. A thesis director may require a student to have a facility in a foreign language or in quantitative skills relevant to the thesis. To complete the thesis, the student must pass an oral defense before the thesis committee. The non-thesis option consists of 36 hours of course work. To complete the non-thesis M.A., a student must pass an oral exam in the candidate’s field of study that a three-member faculty committee will administer. The student will choose which option to pursue in consultation with faculty members familiar with his or her research interests and career goals. Students should pursue a rationally structured course program to be designed on an individual basis in close consultation with the Graduate Program Coordinator. As part of this program, MA students must take a course on historical methods, a one hour professionalization course, 3 historiography courses, and at least one 700-level research seminar. All graduate students may, with the approval of the Graduate Program Coordinator, include as part of their program a limited number of graduate courses in other departments. The department offers several graduate assistantships every year; each pays as much as $12,000 per year and automatically includes a tuition scholarship. The assistantships are competitive and based on merit, and all applicants to our program are automatically considered for these assistantships. The Graduate School administers a fellowship program to promote diversity. These fellowships are available to persons who identify as members of groups (African-Americans, Latinos, and Native Americans) that have historically been under-represented in graduate education programs. This program may provide stipends and cover tuition, but online programs are NOT eligible. A graduate student may combine any of the above awards. The Graduate School also provides, on a competitive basis, Dissertation Fellowships to a limited number of students nearing the completion of their doctoral studies. More information on graduate fellowships and aid may be found at the Graduate School website listed above. *send a sample of their written work via email to the Chair of the Graduate Advisory Committee, Marc Lerner. The department’s Graduate Advisory Committee makes its decision regarding each application after assessing all of the application materials together, and not by applying any rigid standard or mathematical formula. 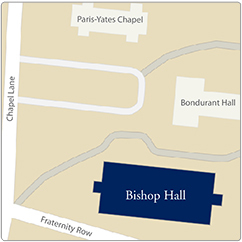 Both as a department and individually, the faculty welcomes inquiries from prospective graduate students, and encourages them to visit the campus. Those interested in learning more about the master’s program in history at the University of Mississippi are encouraged to consult our Graduate Student Handbook February 2019.